This project with establish the foundations for the Sustainable Sky Institute's think tank research program. The research to be undertaken by the in-house team will focus on ground-breaking opportunities for global scale impact unlike any previously seen as we work towards the objective of a sustainable air transport system. Sustainable Sky will employ an expert and innovative in-house team to conduct high-value high-priority research with a specialisation in thought leadership, digital technology solutions, and big-data challenges. The think tank's research topic choices will be dependent on approval by Sustainable Sky’s expert Board of Advisors and budget availability. It will aim to address stubborn market barriers and complex knowledge gaps seen on the roadmap towards the objective of sustainable aviation. This particular project will establish the foundations for the think tank and hire the preliminary team. After the disappearance of MH370 the airline industry again vowed to enable the live down-link feed of aircraft operational flight parameters in the near future via secure satellite connection to a ground based data warehouse, ideally run by the UN's impartial ICAO for safe keeping. Doing so will improve safety and security outcomes as the data could be instantly accessed by approved individuals in the event of a crash, aircraft disappearance or security incident to provide much needed urgent information. What hasn’t been so readily considered are the huge benefits such a data source could also provide to improve environmental outcomes. A live feed of actual data including location, altitude, speed, fuel flow, wind speed, temperature and atmospheric pressure from the global aircraft fleet would contribute hugely valuable data to significantly improve global climate models, weather forecasting and flight route optimisation reducing fuel consumption. Additionally, this data could be used to instantly improve the ease and reduce the cost to airlines associated with fuel consumption tracking and airline emissions footprinting. This carbon data (expected accuracy better than ±0.5%) would be enormously beneficial to the proposed global aviation emissions 2020 market based mechanism that requires trustworthy data. This project would be a multi-stakeholder in-house feasibility research activity that would explore the design of such a system to deliver the best outcomes. The resulting independent thought leadership report would likely be game changing towards this clear goal. 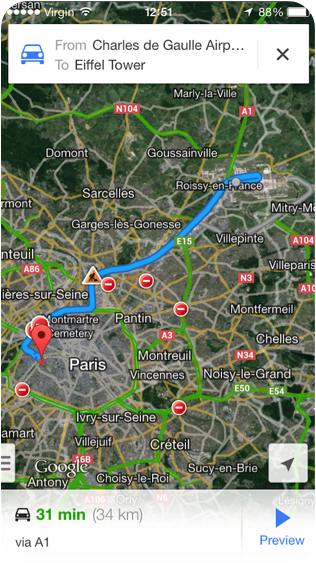 Screenshot from Google Maps online platform showing real time estimated drive time from Charles de Gaulle Airport to the Eiffel Tower early in the morning on 29 August 2014. Google Maps calculates accurate estimated drive times utilising a variety of data sources including official speed limits, recommended speeds, likely speeds derived from road types, historical average speed data over certain time periods (sometimes just averages, sometimes at particular times of day), actual travel times from previous users, and real time traffic information. Google Maps mix data from whichever sources they have, and come up with the best prediction they can make for fast and efficient routing. This project would be a step towards creating a similar solution for flight planning integration or even directly into the autopilot/flight computer. In the years until the Black Box Sustainability Research Initiative (mentioned earlier) or similar is able to deliver on its mission (inevitably post-2020), a gap-filler solution will likely be necessary as a result of the global aviation emissions scheme already in the pipeline. For that scheme to work a baseline of high integrity airline emissions measurements will soon be needed. 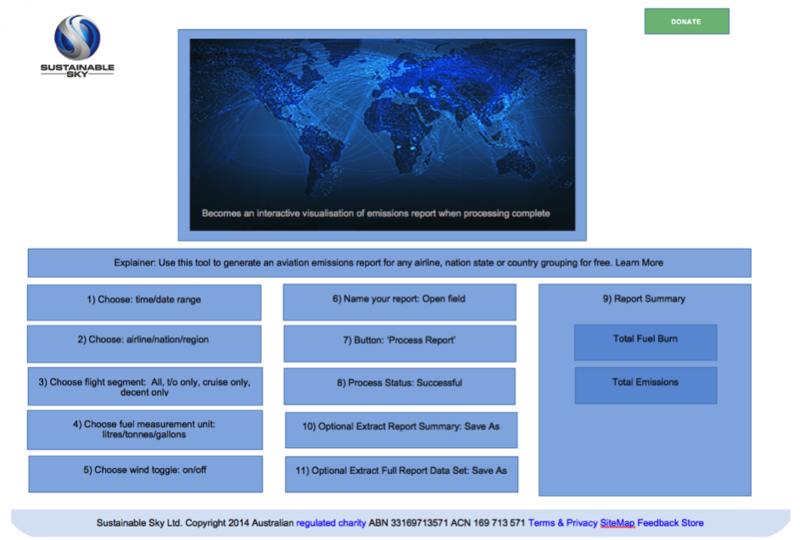 IATA has proposed a manual self-reporting platform called the IATA Fuel Reporting and Emissions Database (FRED) for airlines to add their own data. The Cloud Crosscheck Initiative (CCI) will be a crucial project that is able to cheaply and independently verify airlines’ FRED reported flight emission footprints by utilising operational flight data that is already publicly available. The Cloud Crosscheck Initiative will reduce the instances of erroneous, missing or possibly fraudulent annual emissions data at a company and nation state level. Transparently picking up emissions footprint irregularities in airline self-reports with traceable evidence will help reduce fraud, ensure a level playing field whilst improving market confidence and environmental benefits. In addition to airline emissions reports, the CCI will also be able to provide reports on nations aviation emissions, geographic regions aviation emissions right through to annual global aviation sector emissions. As background, most airlines do not currently disclose their emissions footprint, and of those that do most choose not to have this data independently audited. Airlines that report their flight emissions footprint figure out the numbers by adopting a rudimentary ‘bottom up’ calculation approach – that is they calculate their annual fuel consumption volume, convert it to tonnes and then multiply it by a jet fuel emission factor, typically around 3.14. Fortunately, in recent years thanks to the digital revolution we have entered an age of hyper transparency and big data. CCI will harness this revolution to use a ‘top down’ triangulation approach to verify that each airline and in turn nation state is providing accurate air transport emissions figures (expected accuracy better than ±2%) by using an algorithm to marry online publicly available ADS-B, MLAT and FAA live flight data, online primary radar sources, online aircraft noise trackers, OAG historical flight schedule data, aircraft type fuel burn statistics from Eurocontrol BADA and NASA GEOS-5 weather information. This would be a multi-data-source algorithm similar to that used by the Google Maps navigation service to provide you with an accurate live ETA time while you are driving. Google Maps calculates accurate estimated drive times utilising a variety of data sources including official speed limits, recommended speeds, likely speeds derived from road types, historical average speed data over certain time periods (sometimes just averages, sometimes at particular times of day), actual travel times from previous users, and real time traffic information. Google Maps mix data from whichever sources they have, and come up with the best prediction they can make. Independent emissions auditors (likely the Big Four audit firms overseen by the UN's ICAO) will be able to quickly and freely “crosscheck” any airline’s or nation state’s reported annual emissions with the CCI annual emissions tool to help confirm that the reported figure is free of the omissions and errors that too often occur. 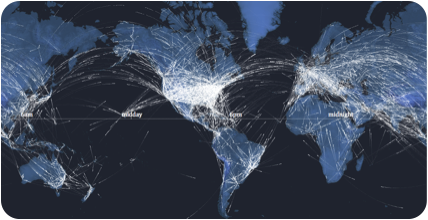 Via creative commons open source plug-in apps, CCI will also provide regulators and scientists the emissions data needed to fill in the gaps where airlines or nations have been unable or unwilling to disclose their flight emissions, supporting more transparent negotiations and more accurate scientific outcomes. CCI will initially use an amalgamation of audited airline emissions data samples to fine-tune the CCI algorithm. In due course when the CCI is fine tuned and trusted, airlines may be able to stop manually calculating their emissions data as they presently do and instead rely on CCI data, saving the airline industry tens of millions of dollars each year. The Sustainable Sky Institute will partner with the UN's ICAO specialized agency to give all stakeholders further comfort that the output report data is impartial, transparent and of high integrity. The calculation methodology and algorithm will be published and open for comment and continual improvement tweaks as further data sources come online. The complex CCI algorithm could be developed at a comparatively low cost via a competition for data scientists held on the Kaggle online platform. The coding of the Graphic User Interface (GUI) could also be developed comparatively cheaply via the open source programming GitHub online platform. A technology partnership with Google and/or Atlassian could also be explored. Somewhat embryonic versions of this project are already in existence, for instance AirServices Australia's (the Australian Government's Air Traffic Management Department) aircraft noise 'Webtrak' free online platform shows live aircraft movement around Australia's capital city airports by using primary radar feed married with on-ground aircraft noise sensors and NAIPS flight planning data. This platform enables regulators to monitor aircraft noise ensuring it is within thresholds and allows the local community to transparently know whose aircraft is overhead should they wish to lodge an aircraft noise complaint. For improved user experience the output data could be visualised in the tool by overlaying it across a Google Maps base map utilising the open source Google Maps Engine. In future this breakthrough emission-tracking model could also be adapted track global marine, rail and trucking transport emissions. Accepted science indicates that it is most likely that emissions released from aircraft at altitude and unique non-CO2 warming effects have a materially different climate change impact compared to those released at ground level. It has been proposed that a so-called Radiative Forcing Index (RFI) multiplier (negative or positive) should therefore be applied when calculating airline emissions to more accurately portray them in greenhouse gas inventories. Current research indicates that the RFI multiplier should probably be applied somewhere between 1x lower and 3 x greater than is the present baseline. Most studies suggest it exists somewhere between a multiple of 2 and 3. In 2000 the UN IPCC estimated a much-quoted and often disputed “reasonable” multiplier figure to be 2.7 when accounting for greenhouse gases alone. If the research shows that it is indeed found to be a positive multiplier this would mean that airlines have a greater climate change impact than is currently believed. 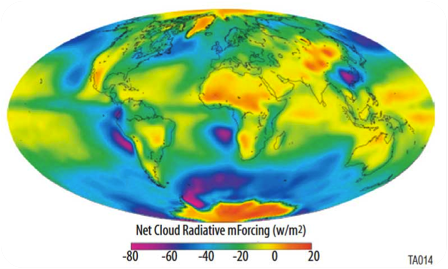 Prevailing IPCC thinking suggests that the radiative forcing of climate change from aircraft emissions (gases and aerosols) is estimated to be +0.05 W/m2, which is about 3.5% of total anthropogenic radiative forcing as measured against the pre-industrial atmosphere. In layman’s terms it is believed that the air transport sector contributes 3.5% to the global anthropogenic climate change impact. If the science shows that a RFI multiplier of, say, 2 should be applied this would mean that the air transport sector is actually contributing around 7% of the impact. Altitude, time periods, latitude, jet contrails, weak data and other factors add high complexity variables when trying to solve this question about what is the appropriate RFI multiplier which helps explain why very few researchers have dared tackle this extremely difficult task. For instance jet contrails and black soot potentially reduce the impact of aircraft emissions by reflecting more solar radiation into space in the short term until they dissipate, whereas aircraft emissions released at altitude potentially stay in the atmosphere for up to a hundred years longer than those released at ground level. The IPCC estimates that the radiative forcing multiplier applicable to supersonic aircraft could be up to five times higher than that applicable to subsonic aircraft which may demand the necessity of aircraft specific RFI figures to be created. It is prudent upon the airline industry to responsibly support research into this topic so that the community may be confident that they are justly playing their part. Doing so would also mitigate any risk of future class actions as befell the tobacco and asbestos industries when they avoided and belittled stakeholder concerns on similar topics of fundamental risk. Initially this think tank would review all available research to provide a ‘State of Play’ report. It would discover the gaps in the research and make recommendations for further investigation. It would then devise and implement a comprehensive research agenda to solve the complex and controversial RFI question once and for all.